Rijeka have the quality to come from 3-0 down to win on aggregate in Aberdeen, Dons manager Derek McInnes has warned. McInnes' side surprised the Croats in the first leg of the Europa League second qualifying round tie. "They are more than capable of scoring three goals," said McInnes. "They scored three goals in the league game on Sunday. "They have shown that. Their pedigree in European competition over the last few seasons is there to be respected." That 3-3 draw with Slaven Belupo suggests that Matjaz Kek's side are still vulnerable at the back. "They have enough of an attacking threat and a style of play that they will always allow them to get chances and we have to make sure we limit that and make the most of our opportunities," said McInnes. "And they could have been a couple of goals ahead of us before we got going over there as well. "We are in a very strong position as the scoreline suggests, but it would be wrong for us to think that the job is done. "There's still work to be done so there will be an approach from us similar to the first tie, which was trying to deny good players of quality real opportunities." Rijeka have reached the group stage in the last two seasons and have wins over Stuttgart, Olymique Lyonnais, Standard Liege and Feyenoord under their belt. "They have dealt with a lot of good sides," said McInnes. "They were huge favourites in the home tie and huge favourites to get through to the next round and they are more than capable of scoring goals." The winner on aggregate after the second leg at Pittodrie will meet the winners of the game in Armenia, where Alashkert, who disposed of St Johnstone in the last round, start 3-0 down to Kairat Almaty of Kazahkstan. 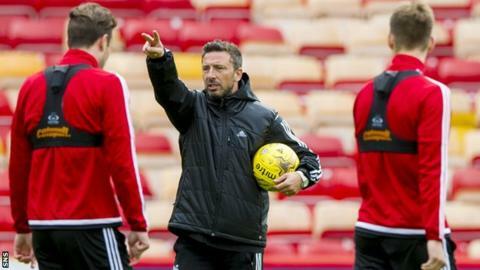 However, McInnes insisted he had given no thought to potential opponents. "We would not have anticipated that level of scoreline in the first match, but it is only half time," he added. "And 3-0 leads can quickly go after half time when there's 45 minutes to go. It is half time in a tie with 90 minutes to go. "The players are well aware we have a lot of work to do. They played against good players last week and the level of concentration has to be there. "We feel we have 90 minutes of hard work ahead of us to try to make sure the good work over there helps us get through the tie."